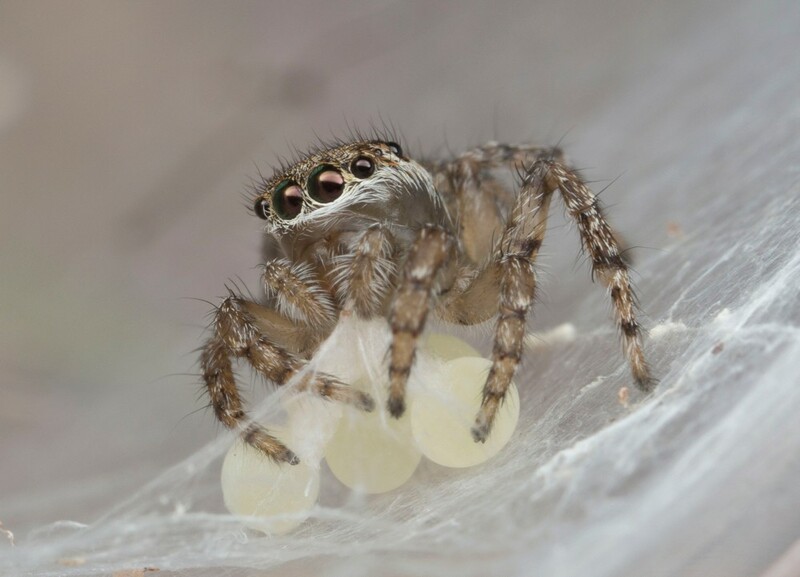 When jumping spiders show their true colors, UC biologist looks through the lens for the reasons. 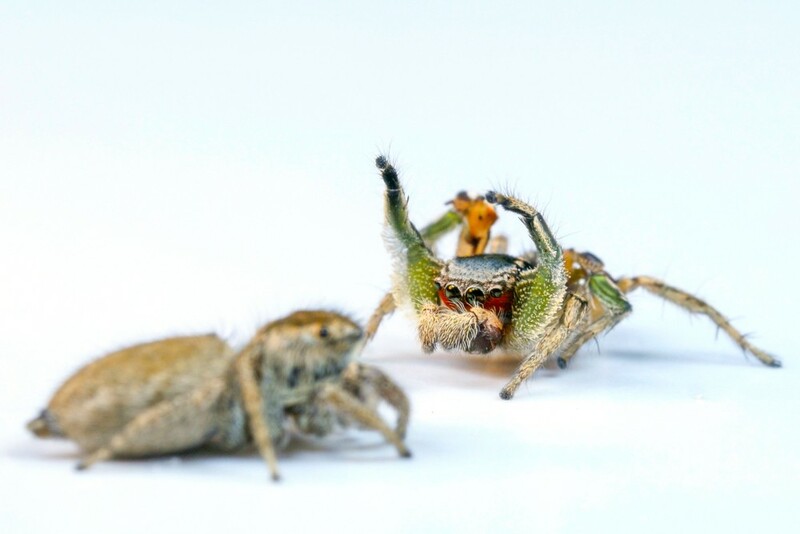 While most arachnophiles will likely find tiny spider dancers who can “swagger like Jagger” entertaining, it’s more than the dance that captures the fascination of one NSF-funded University of Cincinnati researcher. 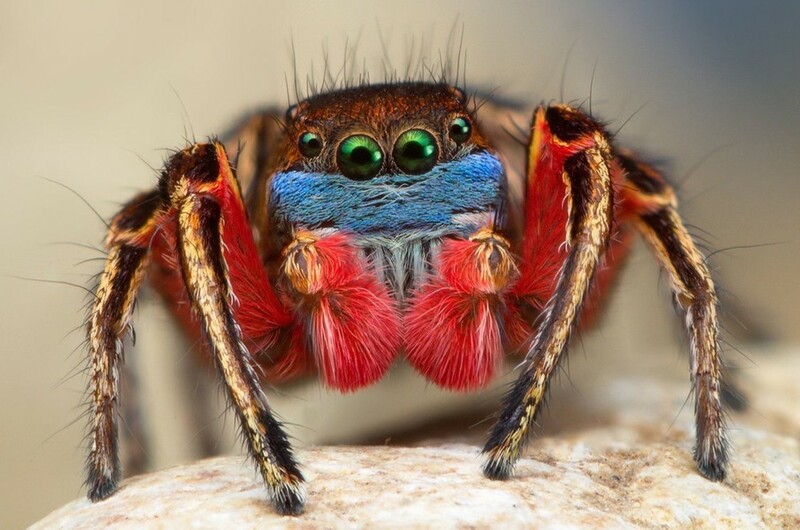 It’s their ability to see color and the bright and bold color patterns on the male body parts that has Nate Morehouse, UC biologist, looking inside the many eyes of two groups of vividly colored jumping spiders. 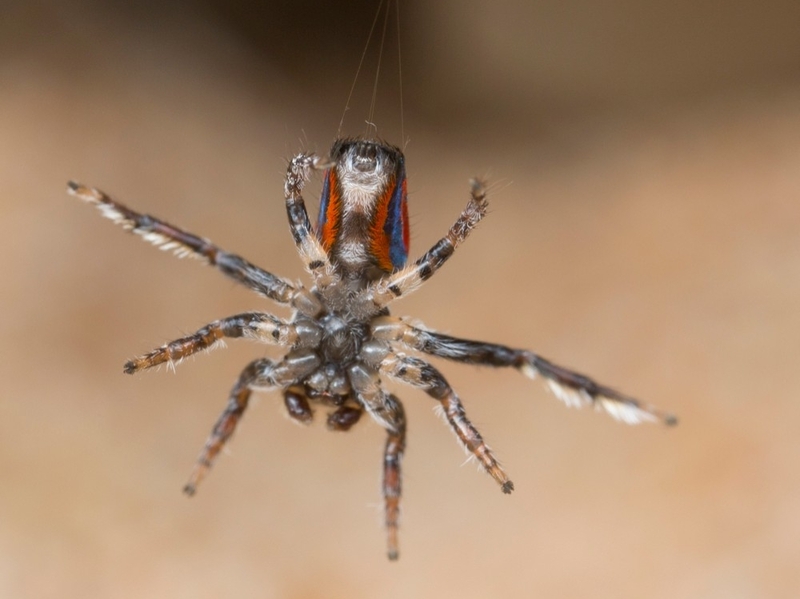 “It’s rare to see bright colors on most spiders, as they don’t usually have the visual sensitivity to perceive color beyond drab blues, greens and browns,” says Morehouse. “But certain groups of jumping spiders deviate from this pattern. 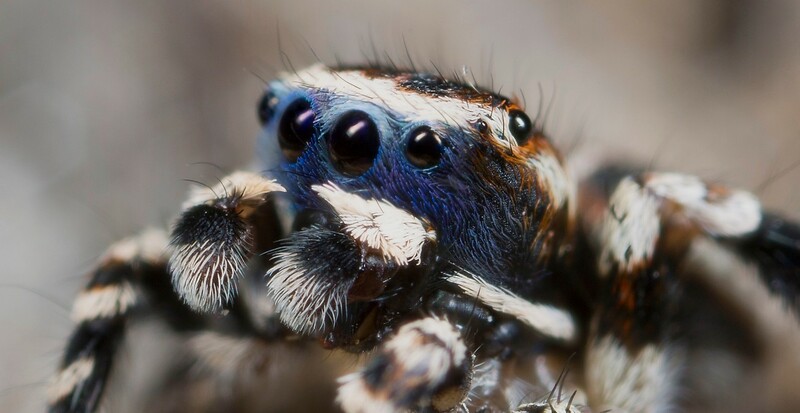 Looking at the two groups of Salticidae –– better known as jumping spiders –– which possess this rare ability to see color, Morehouse, an assistant professor of biology in UC’s College of Arts and Sciences, found that these two groups see color using two completely different mechanisms. 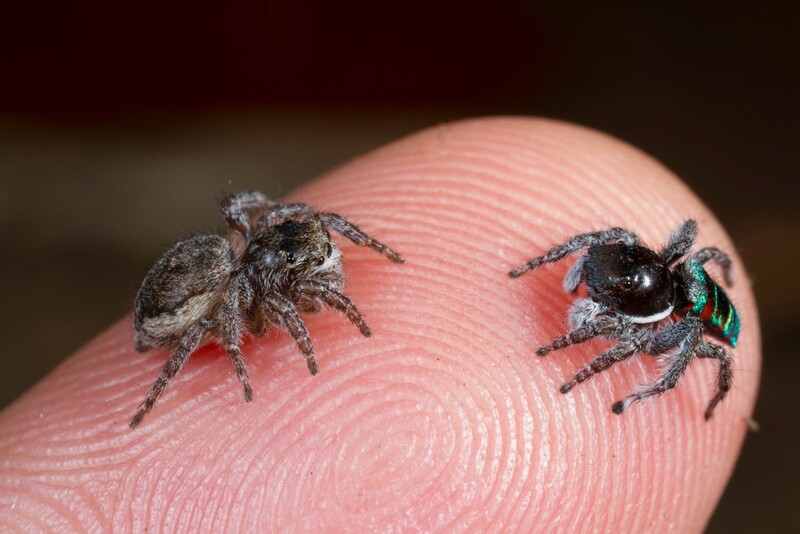 These tiny arachnids classified as the Habronattus jumping spiders of North America and the Maratus “peacock” jumping spiders of Australia, are no larger than a ladybug. 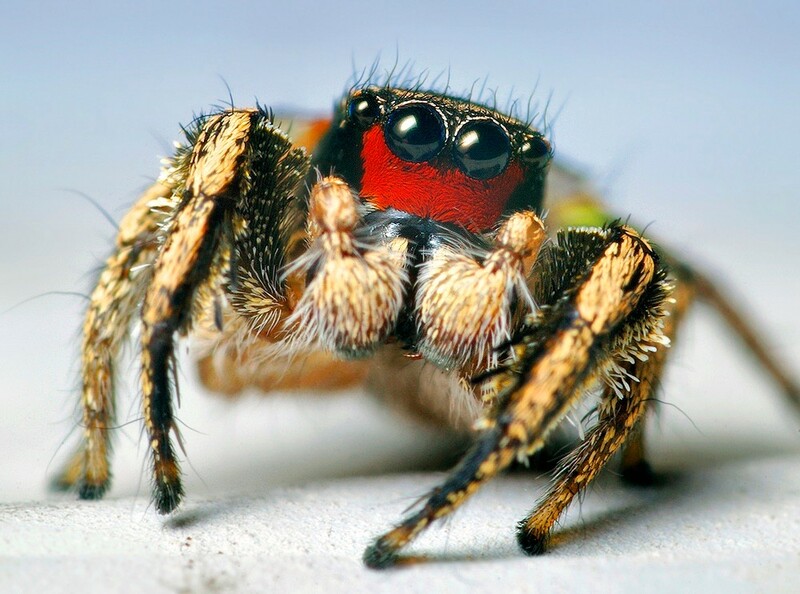 Habronattus spiders possess a red filter on the retina that combines with their green sensitive retinal cells to be able to see reds, yellows and oranges. In contrast, he found Maratus spiders have evolved a completely new type of retinal cell that is sensitive to red, no filter needed. Morehouse, who recently joined UC’s Department of Biology from the University of Pittsburgh, moved his Morehouse Lab and NSF-funded sensory ecology research to work with the biology department’s faculty concentration in sensory biology, behavior and evolution. Now representing the University of Cincinnati, Morehouse recently presented the findings from this study at the 2017 Annual Society for Integrative and Comparative Biology Conference in New Orleans in January. While many male jumping spiders perform sophisticated rhythmic displays when trying to woo little lady spiders, most species cannot see in color. Most simply use their booty-shaking dance moves to get her in the mood. Since other species just see in the range from ultraviolet to green, Morehouse says this explains the mostly drab colors found on those particular arachnid bodies. Why be colorful if your prospective mates can’t see your true colors? 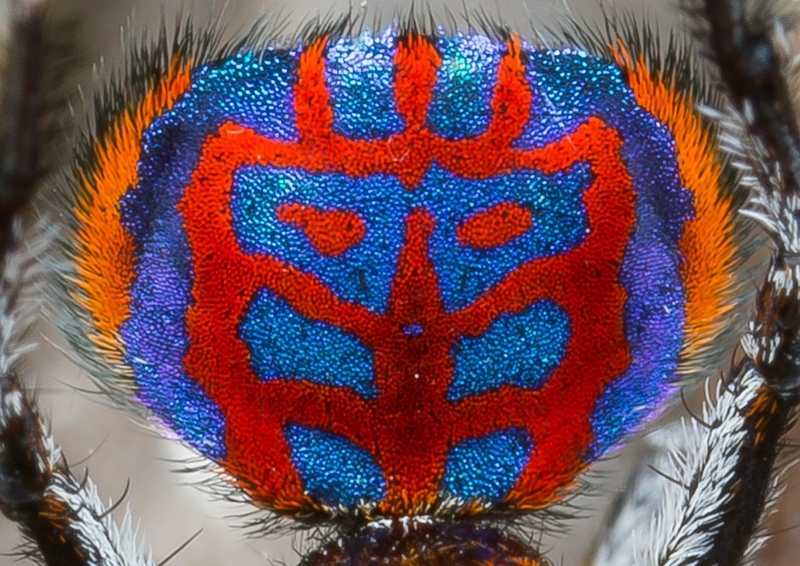 By contrast, Morehouse describes the colorful Habronattus group from North and Central America and the Australian Maratus or “peacock” spiders as two groups that have deviated rather conspicuously from that rule. 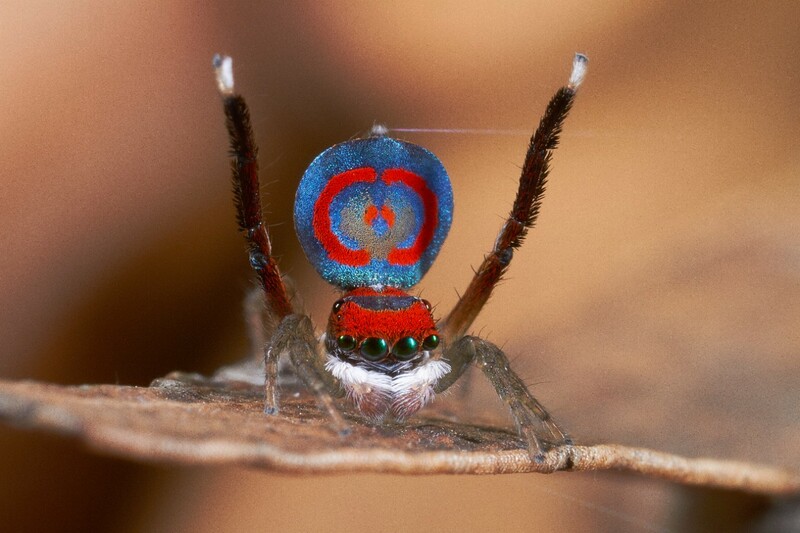 The males in both colorful groups are talented dancers with fancy footwork, have bright oranges, pinks, reds and yellows in their physical display, and the peacock spiders also have an elaborately decorative abdomen flap that they raise up and down like a flag. And both sexes possess the ability to see those colors. 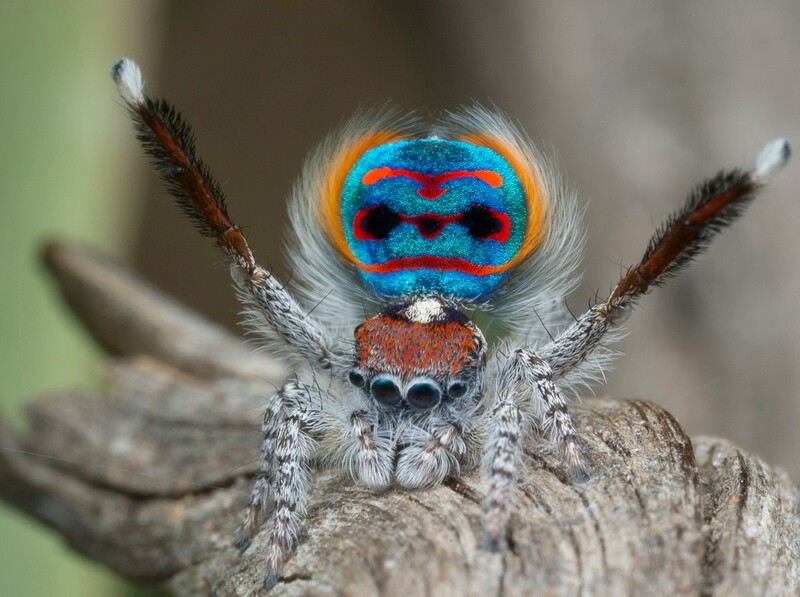 Instead, Morehouse says the savvy peacock spiders see color through ultraviolet, blue, green and red sensitive cells within their eyes, which is most similar to birds. 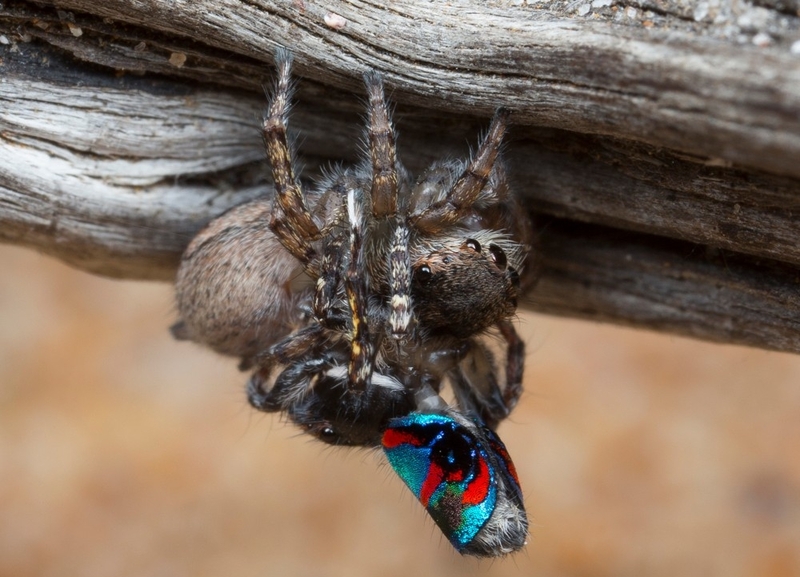 The reason may lie in part because Australian peacock spiders are not related to the Habronattus spiders in North America. While they look similar, Morehouse says they are about as far from the Habronattus group as humans are from hyenas. 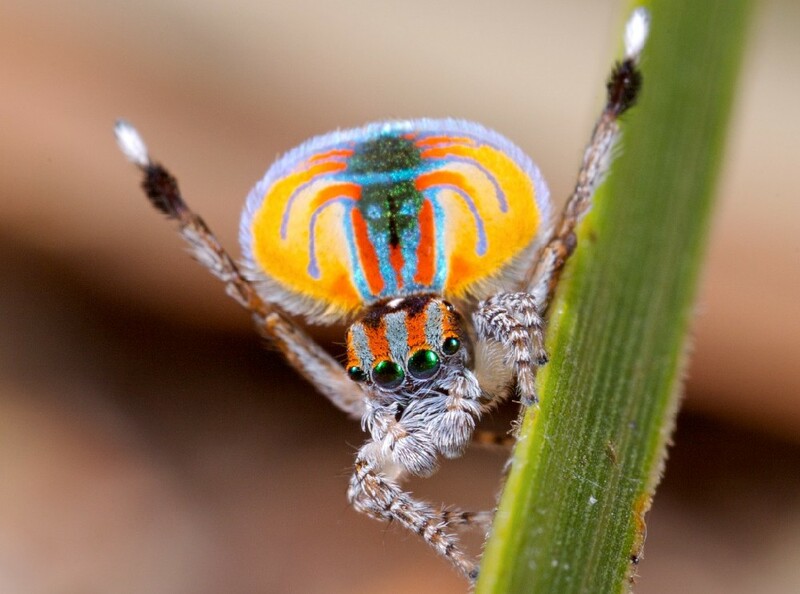 “These Australian peacock spiders have independently arrived at a way of seeing color that is different from the North American spiders,” says Morehouse. Microspectrophotometry –– measures directly how photoreceptor cells in the retina absorb light differently. Visual system modeling –– uses mathematical models to estimate how the retina perceives color. Morehouse has identified two distinct solutions for how these animals see color and both solutions are found within the retina of the principal eyes. Habronattus employs a red filter to create a third type of photoreceptor cell predominantly sensitive to red light. Maratus uses no filters, but has two additional types of photoreceptors –– one is blue sensitive, one is red sensitive. “These additional photoreceptor cells are likely a product of a gene duplication that has subsequently evolved to be sensitive to a different range of colors, similar to the way humans and other higher primates evolved to see color,” explains Morehouse. “Somewhere early in primate evolution the gene responsible for the protein that gives us our green sensitivity got duplicated into two copies. Gene duplication is increasingly credited as a mechanism for evolving functions, Morehouse says, including new visual functions. 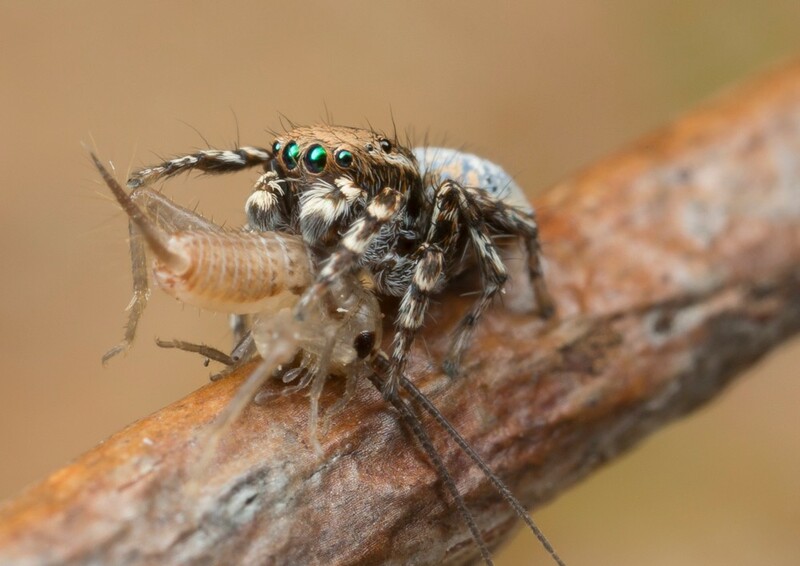 In the case of the jumping spiders, color vision provides a valuable new trait for not only luring their mates, but is especially critical for successful foraging. He explains these fuzzy fur balls as voracious predators eating a wide variety of small insects and some of their prey are brightly colored, which can signal their toxicity to other predators like birds and dragonflies. So fortunate spiders that can see these warning colors are also at an advantage for discriminating between brightly colored toxic prey and non-toxic prey. “We think that more effective foraging is the major reason for the evolution of color vision,” says Morehouse. But what about the bright colors of males? Wouldn’t this lead them to be more obvious to spider predators? Morehouse points out that bright male body colors are usually only observable from the front when the spiders are face-to-face. The males may wave their legs around in a kaleidoscope of colors but Morehouse says it typically only shows on the underside. When birds observe these rare, multi-hued spiders from above they only see their mottled drab colors of brown, black and tan patterns on the surfaces facing upward. The result is a clever solution: camouflage on top for predators and bright color displays in front for members of their own species. 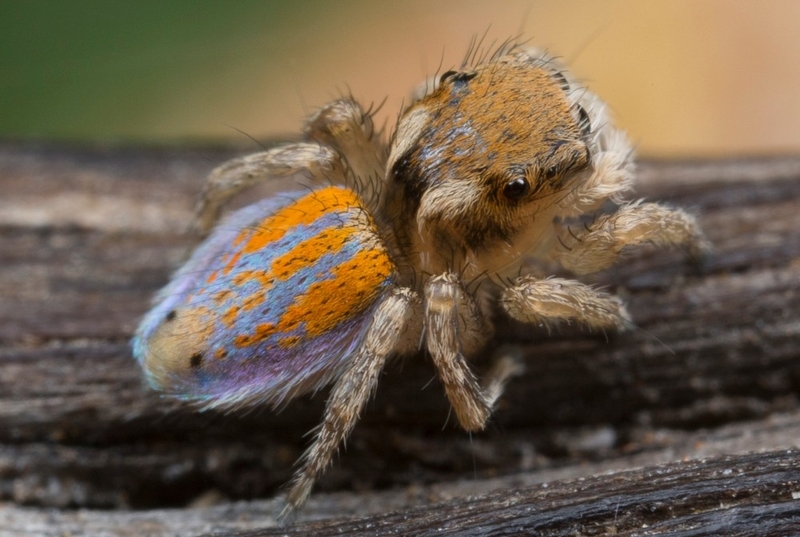 Morehouse hopes to continue this research by looking at a group of spiders in India that are brightly colored and unrelated to either of these two groups. “If we increase our knowledge of additional groups that have transitioned to more sophisticated color vision, we’re in an exceptional position to understand why color vision evolves in the first place and what consequences it has for color signaling behavior and the ecology of these species,” says Morehouse. This work is partly funded by a current, NSF grant (IOS-1557549). For this research: Nathan Morehouse acknowledges his appreciation for the tremendous contributions by his colleague photographers Thomas Shahan and Daniel Zurek for the North American Habronattus spider images and Jurgen Otto and David Knowles for the Australian Maratus spider images and video.